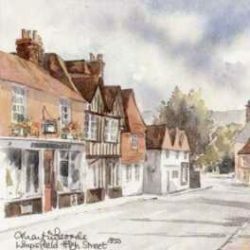 Flashback Friday: Limpsfield Village in the snow? Actually we’re not entirely sure if this is Limpsfield in the snow or not – it could be the age of the print – it looks pretty wintry though! It’s taken from outside what was then The White Hart pub (Lord Rodney/Rodney House) looking down the high street. The photo is stamped J Brasier, who was J Brasier of the Brasier & Sons family, Builders & Undertakers, based at Brasier’s Cottage, next to what is now Ebbutt & Sons Funerals. They were carpenters and journeymen by trade, so presumably made the coffins as well as undertook the burial? Next PostNext Get merry this Saturday at the Limpsfield Community Orchard’s Wassail Party!